ARTfarm Wednesday, 3–6 p.m.: Time for a Rain Dance! Our last Wednesday for the summer! Open 3–6 this afternoon and then only Saturday mornings, 10 AM – 12 noon. Today’s farm treats include: sweet corn, salad mix, baby spicy salad mix, baby arugula, microgreens, baby onions, baby beets, cucumbers, holy basil, thai basil, Italian basil, papaya, passionfruit and bananas. 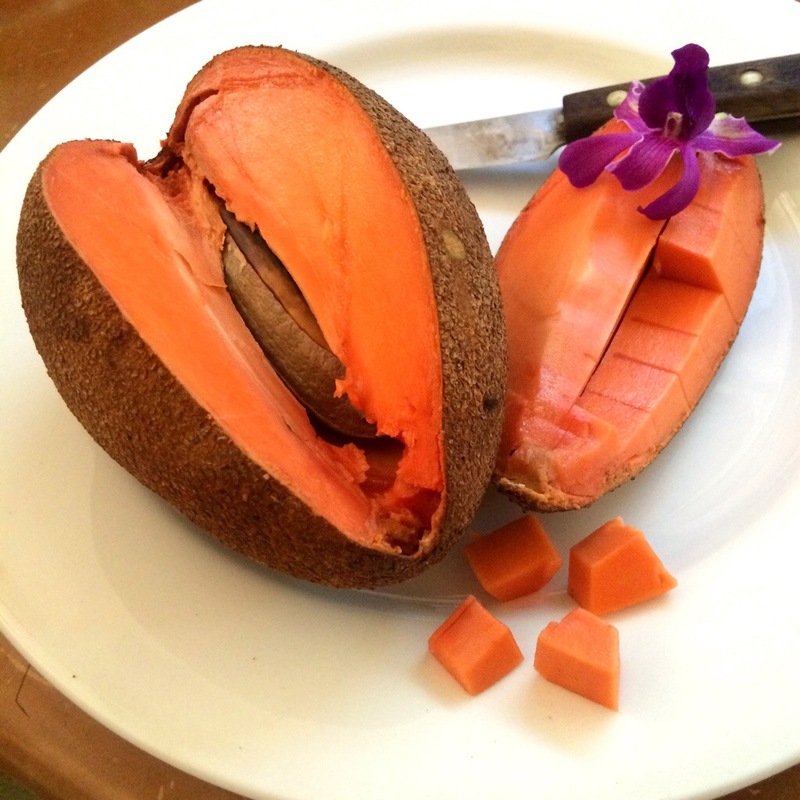 From our partners: mangoes and mamey sapote from Tropical Exotics, raw local honey from Errol, and vegan coconut milk-based ice-cream in tropical fruit flavors from I-Sha! The fruit is eaten raw or made into milkshakes, smoothies, ice cream and fruit bars. It can be used to produce marmalade and jelly. Some consider the fruit to be an aphrodisiac. Some beauty products use oil pressed from the seed, otherwise known as sapayul oil. The fruit is an excellent source of vitamin B6 and vitamin C, and is a good source of riboflavin, niacin, vitamin E, manganese, potassium and dietary fiber. Research has identified several new carotenoids from the ripe fruit. Good news/bad news time, dear readers: Due perhaps to the extremely dry conditions we’ve had over this spring and summer, the Nam doc Mai, Julie and Malika mangoes are ending early. The harvest is finished, but the trees are flowering now, which means that they should have fruit again in a few months. So there will be a strange off-season of mangoes in fall/winter if all goes well and the trees hang onto their fruit through the storm season. We still have several more weeks of cucumbers in the gardens, some dragonfruits ripening on the vines, and we will do our best to continue some lettuce production despite the super dry conditions for a few more weeks. Everybody, please do a rain dance out there and let’s get some precipitation on St. Croix!